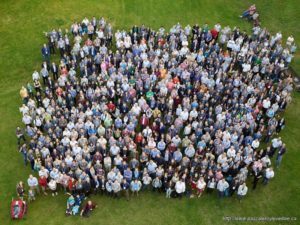 The eleventh International Conference on Permafrost was held from June 20th to 24th in Potsdam, Germany. The conference was well attended with nearly 800 permafrost scientists and engineers, including many young permafrost researchers. Eroding bank of a thermokarst lake in Old Crow Flats, Yk. Pascale presented on the rates of organic carbon input in thermokarst lakes due to the erosion of shorelines in a tundra area of Old Crow Flats.This topic will be addressed in an up-coming paper co-authored with Elyn Humphreys, Zoe Braul, and Chris Burn. Preliminary results indicate that, in the area examined, approximately 0.22 teragrams of organic carbon fall in thermokarst lakes every year due to the erosion of the shorelines, including approximately 0.15 teragrams of organic carbon that was previously stored in permafrost. Krystal and Pascale submitted a FrostByte video to introduce the research that Pascale will be presenting in Potsdam at the International Conference on Permafrost, June 20 to 24 2016. FrostByte prepared by Krystal Siebert and Pascale Roy-Léveillée for the XI. International Conference On Permafrost, June 20-24, 2016, Potsdam, Germany. 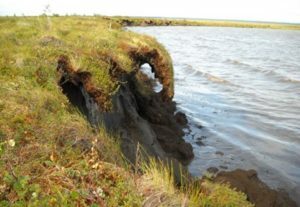 This study examined rates of organic carbon input from bank erosion around a tundra lake and use this information to estimate rates of carbon input at the landscape scale. This study was conducted in a tundra area of Old Crow Flats, northern Yukon.